The Severalnines team is pleased to announce the release of ClusterControl 1.2.8. This release contains key new features along with performance improvements and bug fixes. We have outlined some of the key new features below. YUM/APT repositories for ClusterControl: We are excited to announce the availability of YUM/APT repos for ClusterControl, making new releases of ClusterControl easily accessible using YUM or APT package managers. The repo is found at http://repo.severalnines.com. For step by step instructions on how to use the repo, see this blog post. 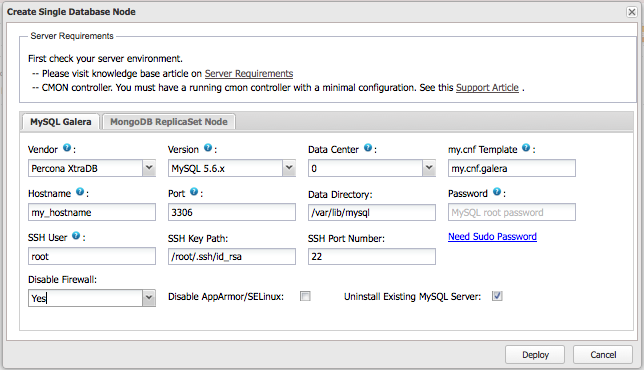 Deployment of single-node MySQL, MariaDB and MongoDB: It is now possible to deploy single database nodes from ClusterControl. Once a single node is deployed, it can then be managed from the ClusterControl interface. Single nodes can be scaled into clusters with a single click of a button. MySQL and MariaDB are turned into Galera Clusters, and MongoDB into a ReplicaSet. So you can now start small, and easily add scalability/HA when the business or your development/test environment requires it. ClusterControl integration with PagerDuty - Alert and Incident Tracking: PagerDuty is an operations performance management platform used by thousands of Ops teams. You can now integrate ClusterControl’s alerting with your PagerDuty account. 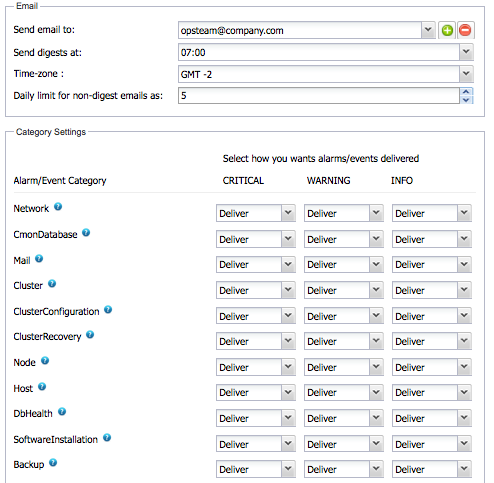 By integrating with PagerDuty, you can be alerted when alarms are triggered within your ClusterControl environment. For detailed step by step instructions see this blog post. 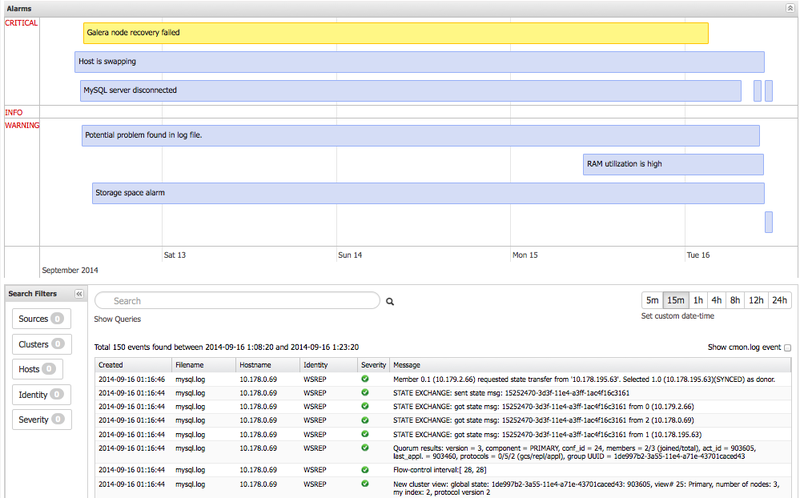 Unified Event Viewer: Through this interface, we’ve merged a number of logs and tried to correlate them with alarms/events to present a unified view of log records coming from multiple sources. Troubleshooting distributed database systems, where problems span across multiple hosts, often requires an admin to search through different types of log entries, from multiple hosts. This will help sysadmins analyze the relevant data and hopefully gain quicker insight into issues. It enables you to specify the conditions under which alarms are triggered and when/how they are delivered. Audit Logging - Administrator Activity Tracking: Audit trails might be required in an organization for compliance reasons, and ClusterControl now maintains a record of actions performed by ClusterControl users. Any action performed by a user is logged in the Job log, and it is now possible to see who performed the action, what that action actually entailed and from which IP the action originated. 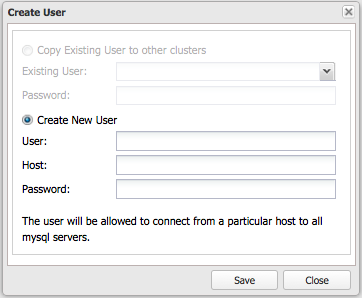 Cluster-wide MySQL User Management: This allows the Administrator to easily create the same MySQL users across multiple clusters, and manage their privileges all at once. New Default Dashboards for MySQL & MariaDB: We’ve added a few useful graphs as part of the default Overview page. Tip: ‘Enable Show Servers’ in the Overview page. Puppet Module for ClusterControl: For users automating their infrastructure with Puppet, we’ve created a module that will install ClusterControl and configure it to manage already-deployed clusters. This blog post tells you all you need to know to integrate ClusterControl with your Puppet infrastructure. We encourage you to provide feedback and testing. If you’d like a demo, feel free to request one. With over 7,000 users to date, ClusterControl is the leading, platform independent automation and management solution for MySQL, MariaDB and MongoDB clusters.